Where you stay depends on your idea of relaxation. The two most popular towns on the Dutch side of St. Maarten (in terms of tourism) are Maho and Philipsburg, the former to the west and the latter on the east. There is a Sonesta property located in each, and I had the opportunity to tour and experience both while I was on the island in February. The distance between the two towns may be short as the crow flies (few miles), however they offer very different avenues of relaxation and activity. It is important to understand the surroundings when deciding where to set up shop for the week – don’t assume you’ll get the same experience at each Sonesta. Maho has the entertainment, nightlife, and the infamous airport, while Philipsburg boasts the views, shopping, and water activities. While you will certainly get a comfortable room at either Sonesta – the accommodations are consistent and both offer all-inclusive options – the decision is really about the towns in which they reside. It won’t take long for research on St. Maarten to reveal the playground that is Princess Juliana Airport. The runway dead ends into the small beach of Maho, and it’s one of the most popular attractions for tourists who come to the island. The reason is very obvious: The planes essentially land on top of your head. If you’ve ever wanted to stand under a 747 as it lands or behind one as it takes off, this is your shot. The sight of the planes coming in is absolutely amazing – even from a distance as you lounge on the Sonesta property – but that’s just the tip of the iceberg when it comes to entertainment. If you’re the type of person who likes to dine out on vacation, Maho is where you want to stay. Clubs, bars, a golf course, and restaurants are all within walking distance, the majority of them next door to the Sonesta (literally a one-minute walk). From sushi to barbecue, hip-hop to piano classics – you’ll run out of days before you run out of options. Nightlife means noise. It was not uncommon to hear loud music late into the night. The planes aren’t quiet and, to a point, demand attention. There were times when I caught whiffs of burnt rubber, especially when the wind blew in my direction. Although the engine noise did not bother me, I could see how it might wear on some people day after day. They come in often, and they do temporarily interrupt the tranquility, no question. Maho Beach is small and usually crowded due to the tourists who come from other towns to see the airplanes. Since erosion has almost completely washed out the beach in front of the Sonesta, guests looking for long stretches of white sand will have to go around the corner to Mullet Bay (http://www.st-maarten.com/index.php/mullet-bay-beach). The Sonesta Maho has live music on certain nights, as do the beach bars of Maho Bay. Be sure to check the schedules upon your arrival (or step out on your balcony and listen for the music). Casino: Located directly across the street from the Sonesta. Head in to play some slots or cards before/after dinner. Piano Bar: Featuring a late-night happy hour (until 10 p.m.) and solid Italian food, I found this to be a pleasant place to spend an evening. Grab a table and request your favorite songs from the rock ‘n’ roll pianist – they have live music every night and it is a nice spot to linger over appetizers and an entree. Be prepared to clap and sing along. Sunset Beach Bar: Although this notorious restaurant has become a huge destination for tourists and cruise ship passengers (and thus overpriced), it is still a must-do in my mind when you’re on the island. 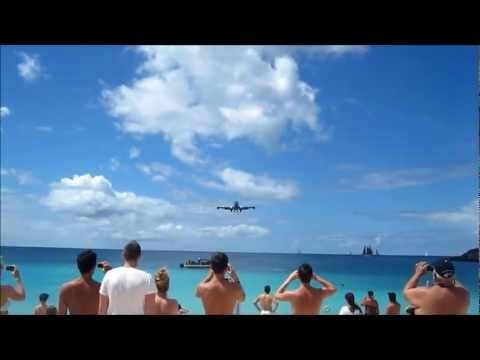 It’s location on Maho Beach allows patrons to sit and watch the planes landing at Princess Juliana Airport. It’s a very relaxed and outdoor atmosphere – go for a long lunch and afternoon cocktails.